My Beads & Crafts @ Etsy! Places - Where is this? Whimsy, Antique & Vintage Items including Paintings, Prints, Sculpture, Figurines, etc. Sports Collectibles - Trading Cards, Souvenirs, etc. Handmade, 3-inch long Tassels, DMC Egyptian Cotton. 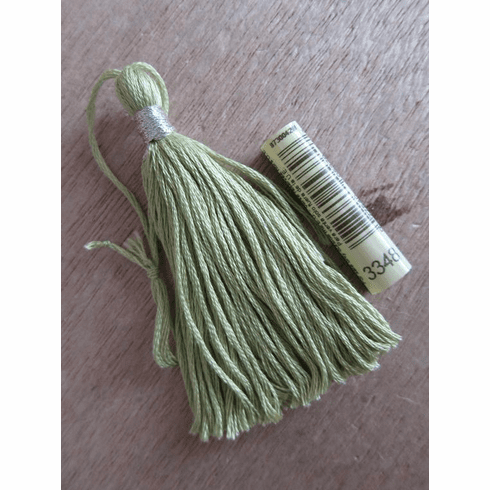 This Tassel is made using one full skein of DMC-3348 "Light Yellow Green" and is available by itself or with tassels in coordinating colors. DMC-3348 is used in the DMC Coloris colorway "Camelia" DMC-4502 and is available as a set with a tassel made of Camelia and the other four coordinating colors. Each Tassel is made from a full skein of DMC Cotton Embroidery Floss and wrapped with DMC Metallic Embroidery Floss. The top threads have been left for you to twist, embellish, finish or leave - as you please.... For a small charge, we can also finish the top of each tassel for you. Let us know your needs, contact information is below. Color, Materials: DMC-3348 Light Yellow Green and DMC-E168 Metallic Embroidery Floss in Silver. Coordinating Colors for DMC Coloris "Camelia" are the colors that are found in the DMC-4502 colorway: These are DMC Cotton Embroidery Floss in Light Yellow Green (DMC-3348), Pale Baby Blue (DMC-3841), Cranberry (DMC-603) and Dark Cranberry (DMC-601). Copyright � 2008 to 2019 Cherry Blossom in Blue - All Rights Reserved.